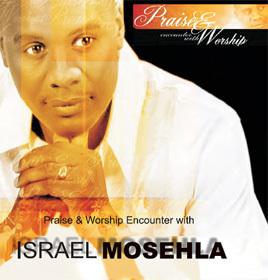 On 28th March 2009, Israel Mosehla recorded his live CD & DVD Praise & Worship Encounter with Israel Mosehla at the Vereeniging Civic Theatre. Launched and released in July 2009. This makes it the third offering of Praise and Worship that Israel has released. On this recording, he worked with all the young people from the Praise and Worship workshops he conducted inside and outside the country. He also gave some of them the opportunity to lead and produce different songs. This live recording reconnects people with God. IN November 2010 Israel won the Award for Best Praise Album - PRAISE & WORSHIP ENCOUNTER WITH ISRAEL MOSEHLA at the CROWN GOSPEL MUSIC AWARDS.